The Stewardship Ministry of the Baptist General Convention of Oklahoma is available to help churches and associations in providing resources and training in Biblical Stewardship, Church Budgets, Missions Support and Stewardship Education. The Stewardship office also provides pulpit supply and seminars for Cooperative Program giving and financial management. The resources available help to lead, teach and develop Christian stewards in their personal commitment and to local church giving. The word stewardship best describes a special relationship between God and man and implies responsible management. Available resources include: poster, CD, bulletin inserts, lessons, theme song, sermon ideas and drama sketches. 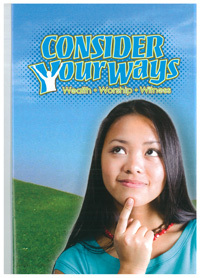 Please contact Wynn Anne Hook at wahook@bgco.org to order resources.